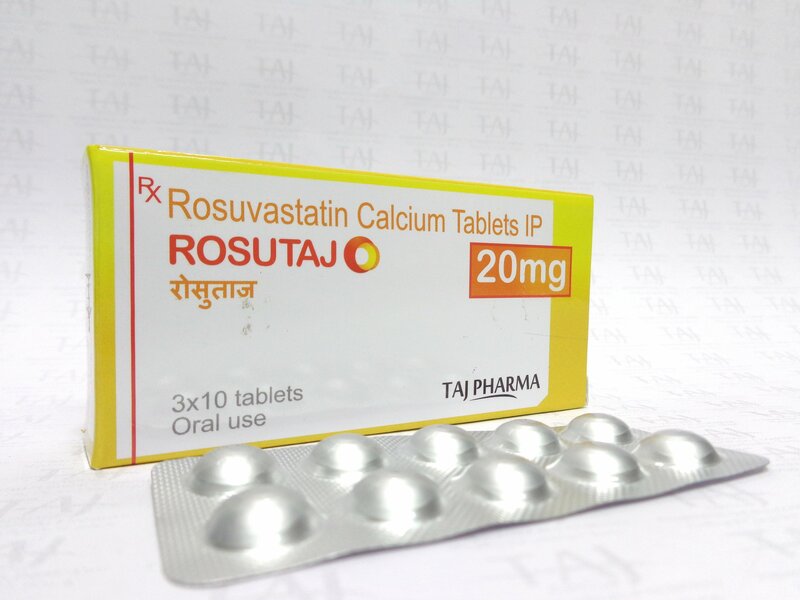 Rosuvastatin oral tablet is available as a generic brand-name drug : ROSUTAJ . Rosuvastatin comes only in the form of a tablet you take by mouth. Rosuvastatin is used to treat high cholesterol, including conditions that are genetic (passed down through families). It’s also used to prevent heart disease. Severe muscle problems warning: This medication can cause severe muscle problems. These include myopathy, with symptoms such as muscle pain, tenderness, or weakness. Myopathy can lead to rhabdomyolysis. With this condition, muscle breaks down and can cause kidney damage and even death. If you notice unusual pain or weakness in your muscles, call your doctor right away. Your doctor may decide to stop your treatment with this medication. Liver problems warning: This drug can increase levels of your liver enzymes. Increased liver enzymes can be a sign of liver damage. Your doctor may check these levels to make sure that this drug is not harming your liver. Rosuvastatin is a prescription drug. It comes in the form of a tablet you take by mouth. Rosuvastatin is available as the brand-name drug ROSUTAJ. It’s also available as a generic drug. Generic drugs usually cost less than the brand-name version. In some cases, they may not be available in every strength or form as the brand-name drug. Rosuvastatin is used to reduce your LDL (bad) cholesterol levels and increase your HDL (good) cholesterol levels. It also reduces your levels of triglycerides (fats in your blood). Improving your cholesterol levels helps prevent blockages from forming in your arteries. These blockages can cause serious problems, including heart attack or stroke. Rosuvastatin belongs to a class of drugs called statins. A class of drugs is a group of medications that work in a similar way. These drugs are often used to treat similar conditions. Rosuvastatin works by blocking enzymes in your liver that make cholesterol. This lowers your levels of LDL (bad) cholesterol. It also raises your levels of HDL (good) cholesterol. Rosuvastatin oral tablet doesn’t cause drowsiness, but it can cause other side effects. Rosuvastatin oral tablet can interact with other medications, vitamins, or herbs you may be taking. An interaction is when a substance changes the way a drug works. This can be harmful or prevent the drug from working well. Examples of drugs that can cause interactions with rosuvastatin are listed below. Warfarin is used to thin the blood. Taking this drug with rosuvastatin can increase your INR. This is a measure of how quickly your blood clots. Your INR may need to be measured more often when you start taking rosuvastatin or if your doctor changes your dosage. When taken with rosuvastatin, certain drugs used to treat HIV can increase levels of rosuvastatin in your body. This raises your risk of side effects from rosuvastatin. These side effects include muscle problems such as muscle pain, weakness, or tenderness. When taken with rosuvastatin, certain drugs used to treat hepatitis C can increase levels of rosuvastatin in your body. This raises your risk of side effects from rosuvastatin. These side effects include muscle problems such as muscle pain, weakness, or tenderness. Cyclosporine is used to decrease the strength of the immune system. Using this drug with rosuvastatin can increase levels of rosuvastatin in your body. This raises your risk of side effects from rosuvastatin. These side effects include muscle problems such as muscle pain, weakness, or tenderness. Colchicine is used to treat gout flares. Using this drug with rosuvastatin can increase your risk of side effects such as muscle pain and rhabdomyolysis. The use of drinks that contain alcohol can increase your risk of liver problems from rosuvastatin. Tell your doctor if you drink more than two glasses of alcohol per day. Be sure to talk to your doctor if you have active liver disease or a history of liver problems. For people with liver problems: You are at higher risk of severe muscle problems from taking this drug. Talk with your doctor about whether this drug is safe for you. For people with kidney problems: You are at higher risk of severe muscle problems from taking this drug. Talk with your doctor about whether this drug is safe for you. For people with an Asian ethnic background: You are at higher risk of side effects from this drug due to increased levels of rosuvastatin in your blood. Your doctor may start you at a lower dosage. For pregnant women: This drug is a category X pregnancy drug. Category X drugs should never be used during pregnancy. Women of childbearing age should use reliable birth control while taking this drug. For women who are breastfeeding: This drug can pass into breast milk and may cause side effects in a child who is breastfed. You should not breastfeed your child while taking this drug. Talk to your doctor if you breastfeed your child. You will need to decide whether to stop breastfeeding or stop taking this medication. For seniors: The kidneys of older adults may not work as well as they used to. This can cause your body to process drugs more slowly. As a result, a higher amount of a drug stays in your body for a longer time. This raises your risk of side effects from this drug. Your doctor will monitor you closely for side effects while you take this drug. For children: For most conditions, this medication should not be used in people younger than 18 years. It can be used in children ages 8–17 years to treat heterozygous high cholesterol. It can also be used in children ages 7–17 years to treat homozygous high cholesterol. Typical dosage: 5–40 mg once daily. This medication has not been studied in children for this purpose. It should not be used in people younger than 18 years. Typical dosage: 5–20 mg once daily. Typical dosage: 5–10 mg once daily. This medication has not been studied in young children for this purpose. It should not be used in children younger than 8 years. This medication has not been studied in young children for this purpose. It should not be used in children younger than 7 years. This medication has not been studied in children for this purpose. It should not be used in children younger than 18 years. For people with Asian ancestry: Your body may process this drug differently. This may lead to increased levels of this drug in your blood. Your doctor will likely give you a starting dosage of 5 mg once daily. For people with kidney disease: Kidney disease can cause your body to process drugs more slowly. As a result, a higher amount of a drug stays in your body for a longer time. This increases your risk of side effects. Your doctor will likely give you a starting dosage of 5 mg daily. Your doctor may later increase your dosage to 10 mg daily. Rosuvastatin oral tablet is used for long-term treatment. It comes with risks if you don’t take it as prescribed. If you stop taking the drug suddenly or don’t take it at all: Your cholesterol may not be controlled. Over time, high cholesterol can lead to serious health problems such as a heart attack or stroke. What to do if you miss a dose: Take your dose as soon as you remember. But if you remember just a few hours before your next scheduled dose, take only one dose. Never try to catch up by taking two doses at once. This could result in dangerous side effects. Do not take more than 1 dose of this drug within 12 hours. How to tell if the drug is working: Your LDL (bad) cholesterol levels should go down, and your HDL (good) cholesterol levels should go up. You won’t be able to tell that the drug is working. Your doctor will perform blood tests to check your cholesterol levels. Keep these considerations in mind if your doctor prescribes rosuvastatin for you. Keep this drug at room temperature between 68°F and 77°F (20°C and 25°C). Cholesterol levels: This test will help make sure that this drug is working to improve your cholesterol levels. Liver enzymes: Your doctor may check your liver enzymes before and during your treatment with this drug. Your doctor will check them carefully if they think you have liver problems. Let your doctor know if you have symptoms such as unusual muscle pain, tiredness, weakness, or loss of appetite. Also mention if you have pain in the right side of your abdomen (stomach area), dark-colored urine, or yellowing of your skin or the whites of your eyes. Before you start taking this drug, your doctor may start you on a special diet to lower your cholesterol. Taj Generics has made every effort to make certain that all information is factually correct, comprehensive, and up-to-date. However, this info should not be used as a substitute for the knowledge and expertise of a licensed healthcare professional. You should always consult your doctor or other healthcare professional before taking any medication. The drug information contained herein is subject to change and is not intended to cover all possible uses, directions, precautions, warnings, drug interactions, allergic reactions, or adverse effects. The absence of warnings or other information for a given drug does not indicate that the drug or drug combination is safe, effective, or appropriate for all patients or all specific uses.